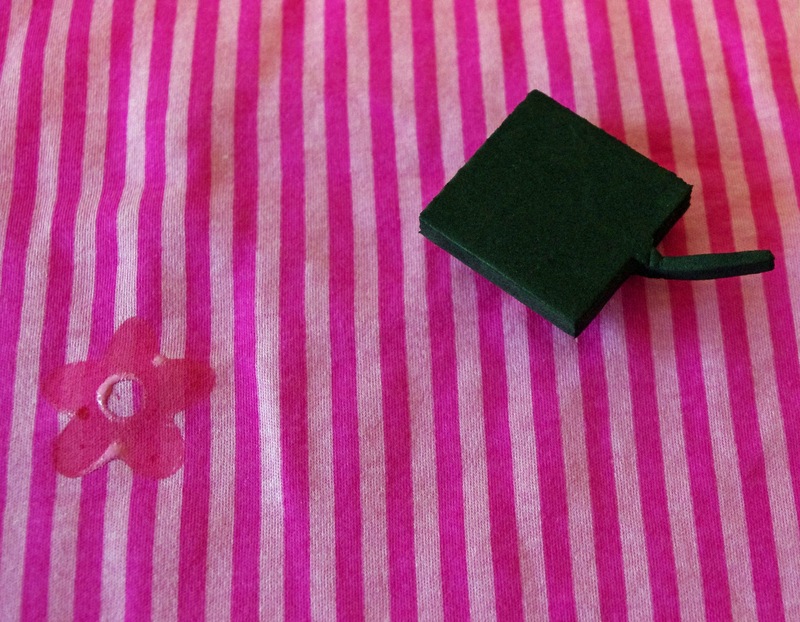 Have you ever found a nice piece of fabric only to wish it had a little something more in the print? Well, with this tutorial you can easily add that little something more to most any fabric. 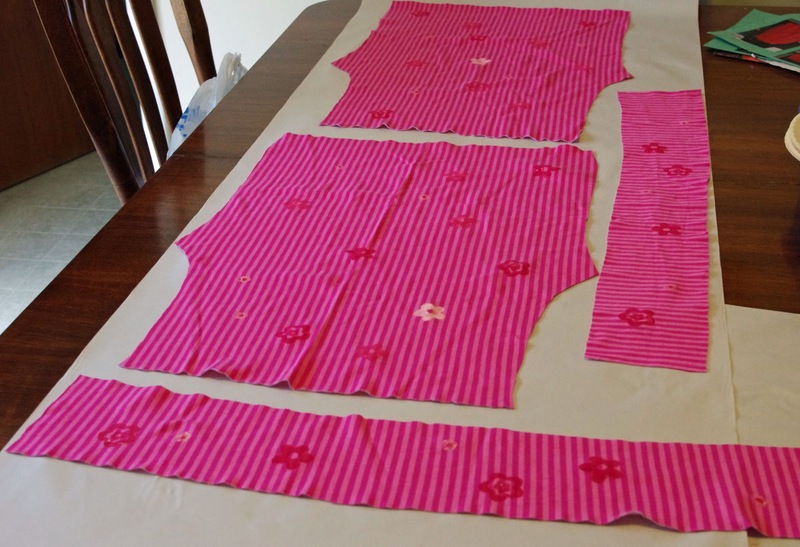 To save on fabric and paint, I cut the pieces for the garment before painting on them. Painting the yardage would have wasted fabric and paint. 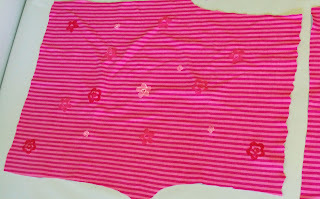 The extra fabric is still the original stripe for a future project. 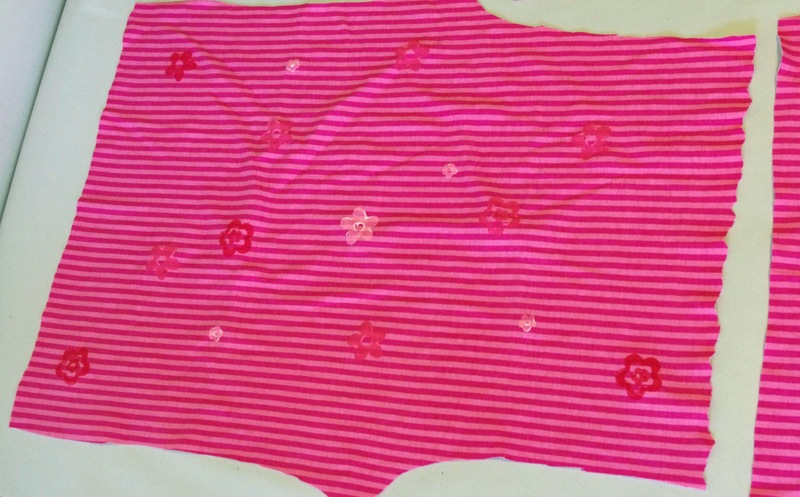 This painted fabric has been made into a pair of Cute and Quick Pants. 1. Mix paints to the color you'd like. Add fabric medium as the bottle suggests. Our bottle suggested 2 parts paint to 1 part fabric medium. 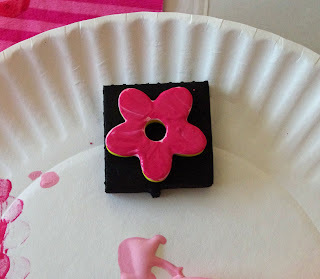 Fabric medium gives the paint a little elasticity and allows the design a bit more flexibility. Test the colors on a piece of scrap that matches the fabric you will paint. 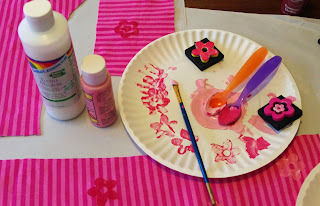 Some paints look different on the plate than on the fabric. Let the test dry about 15 min. so you can see what it will truly look like and make color adjustments as necessary. 3. 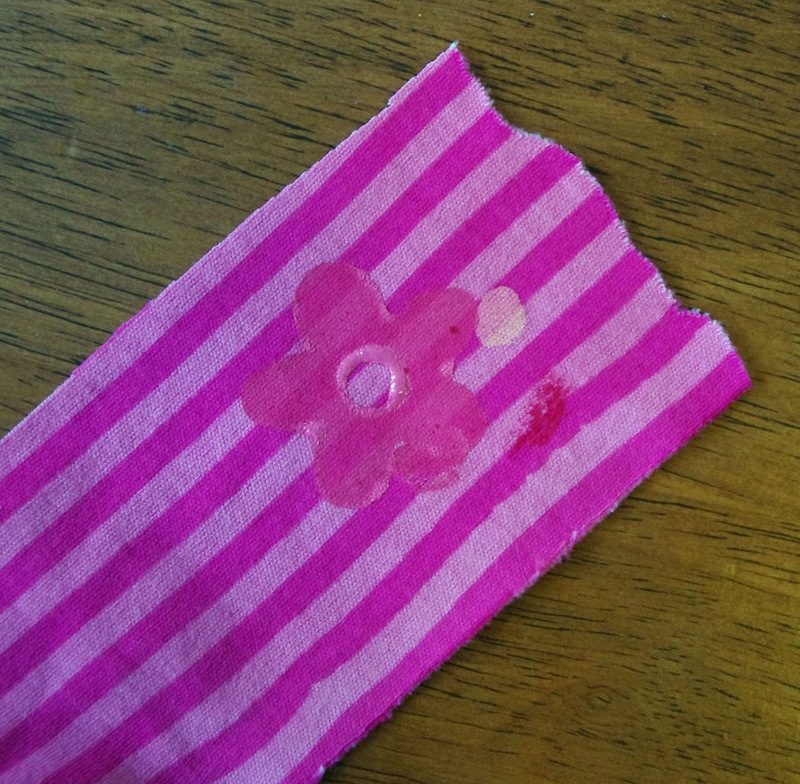 Place the stamp onto the fabric with even and gentle pressure. Wash up stamps and brush. 5. Let dry over night. After a couple of hours, I hung these in our laundry room out of reach. They were dry to the touch at that time. 6. Heat set your prints. 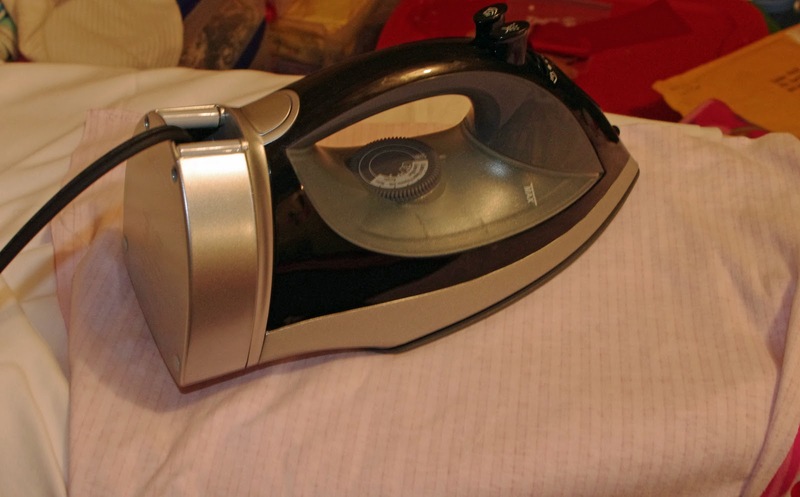 Lay a cloth on top of your ironing board. Lay the fabric face down on the cloth. 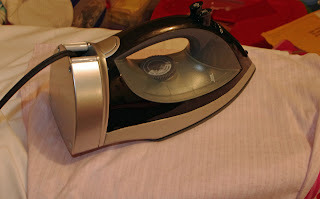 Press, do not slide, the iron on the wrong side of the fabric. Hold for 20 sec. Repeat until all the fabric is covered. 7. Wash and wear as usual. Although, I have yet to fully dry these, as I try not to fully dry our special items. I have dried other pieces fully and haven't any issues with the paint. Our fabric medium bottle says...hang dry. I hope you enjoy making fabric a little more special. We certainly do! In the previous post (scroll down to see) I wrote about "Sharing the Love". We're going to share for another week. So post those photos (tutorial or pattern) or email to me and I'll load them into the flickr group. Someone gets to win a pattern of their choice.